On my Desktop, Thunderbird does a fine job of managing my email accounts. 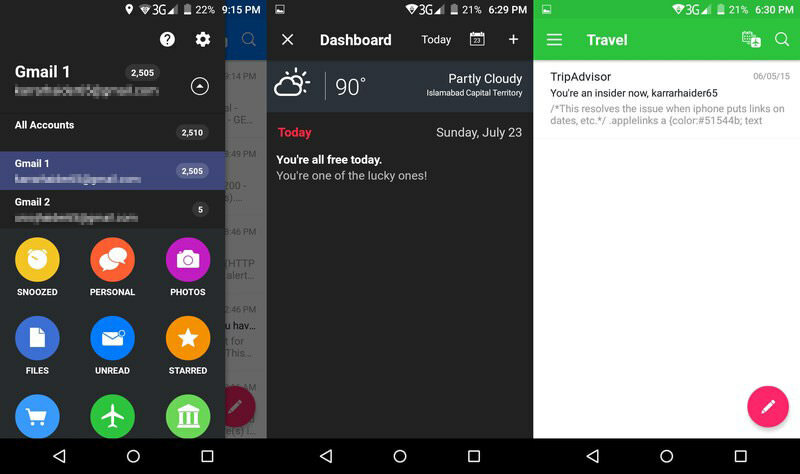 However, as it’s not available on Android phone, I had to do some digging to find a good email client for Android. 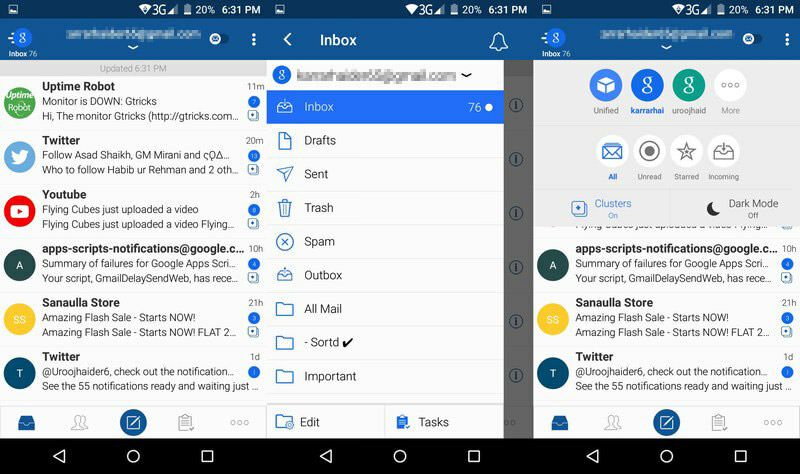 Thankfully, there are a bunch of good email apps for Android to easily manage emails on the go. And after evaluating over a dozen choices, I managed to trim down to 4 of the best ones. Let’s check the following list to see which one of these work for you. For example, you can use the “All Accounts” tag to see emails from all your connected accounts in one place. Best of all, you can even create your own tags using highly customizable filters. It has a personal “Dashboard” section that pulls out everything important in your life from your emails and shows in an easy to gulp interface. You’ll see your reservations, flights, orders, event cards, and everything that’s important. On top of that, your calendar is also synced with Alto to see your schedule right inside it. And I must say, it does a nice job of showing all your schedules in an easy to interact list. Alto really makes it easy to navigate the app. Everything important to you is just a tap away, including the dashboard, your accounts, and all the tags. The buttons are big enough to easily tap, and transitions are smooth to give you that sleek look. Overall, it took me less than 2 minutes to learn almost every aspect of the app. Hail rides right from the app. Uber and Lyft supported. A dedicated dashboard to manage everything “important”. Built-in calendar app to see your schedule, accept invites and manage events. All IMAP based email support, including Gmail, Yahoo, iCloud, Outlook, AOL, and many more. I really like Alto for its ease of use and amazing organizing features. 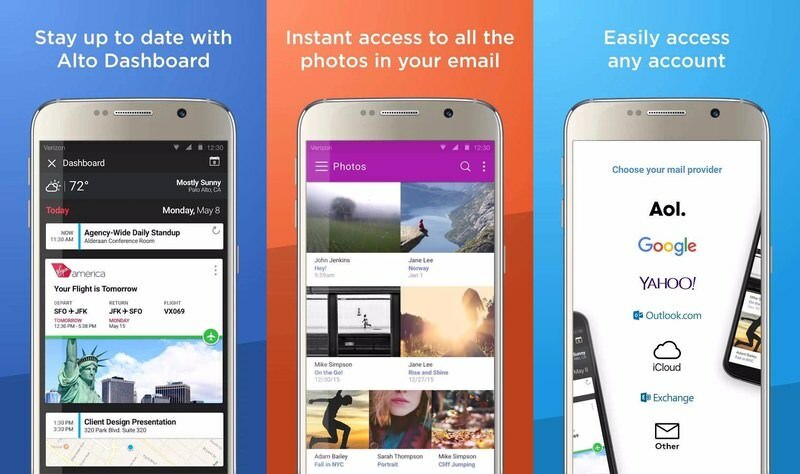 Although, unlike most other email apps, it doesn’t show sender’s picture alongside the email, so it may be a bit hard to skim through your emails. Blue Mail makes it very easy to skim through your emails by showing a photo or a company logo of the sender next to emails. Furthermore, switching between different accounts is very easy through a drop down menu at the top. There is a built-in task manager that will automatically pull out your flight schedules, orders and other tasks from emails and help you see them in a scrollable list. However, I didn’t like the email organizing method of Blue Mail. There are only two options by default, “People” and “All Mail”. And while using the People option, I noticed many company newsletters listed as well. To be honest, Blue Mail interface does seem a little outdated, and I noticed some design flaws as well. For example, there aren’t any big buttons or to be exact, “clear” buttons. It’s not that bad, but I did had a bit difficulty at the start. Addtionally, the total unread messages widget almost covers the main menu button. I actually had to blindly tap on the top bar to find the main menu. 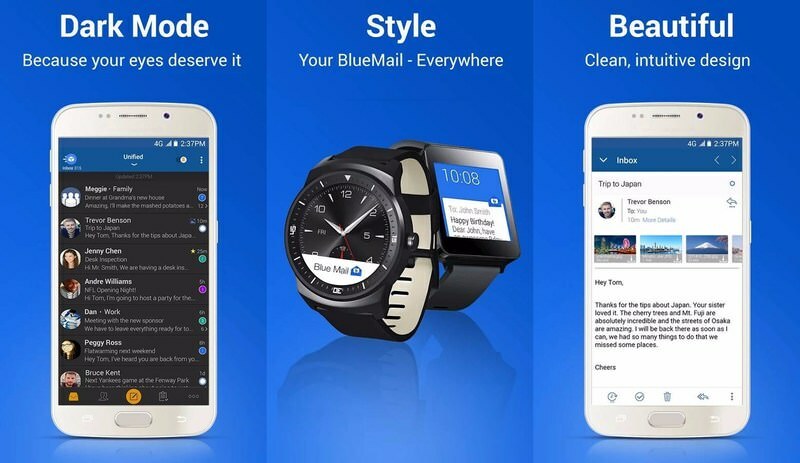 If you can tolerate the interface, then Blue Mail is actually a reliable email client to manage multiple email accounts and easily skim through hundreds of emails. Custom sounds based on sender. Custom sync time for offline use. Apart from some interface flaws, Blue Mail actually does a great job of skimming through your emails and managing them. Although I would have appreciated if more message organizing categorizes were available. 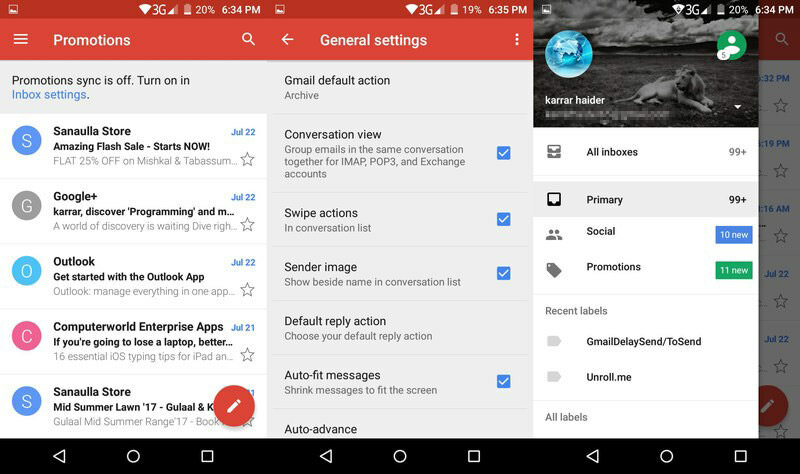 Yes, Gmail also supports non-Gmail accounts like Yahoo, Outlook, AOL, and any other IMAP/POP email account. Best of all, it is already installed on your Android phone, you won’t have to download anything extra. It isn’t one of the most functional apps in this list, but its simplicity is its power. It will organize all your emails from people, promotions and social in separate categorize. And you can also view emails from all the accounts in a single interface. Switching accounts is also really easy, you just need to swipe right and tap on the required account. Unfortunately, you need to be using Google Assistant/Google Now to be able to manage your tasks from email. Gmail has a bare bones interface with very few buttons to worry about. Everything is available from the side menu, you just need to swipe and tap to get what you need. It also shows sender photos along with the emails for easy skimming. Both online and offline working support. Star important messages to keep them in view. 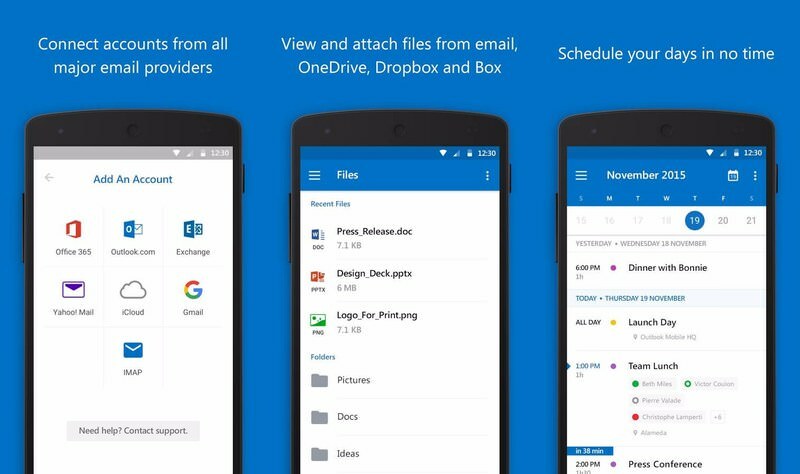 Create custom folders to organize email. I had a hard time deciding between Alto and Gmail. 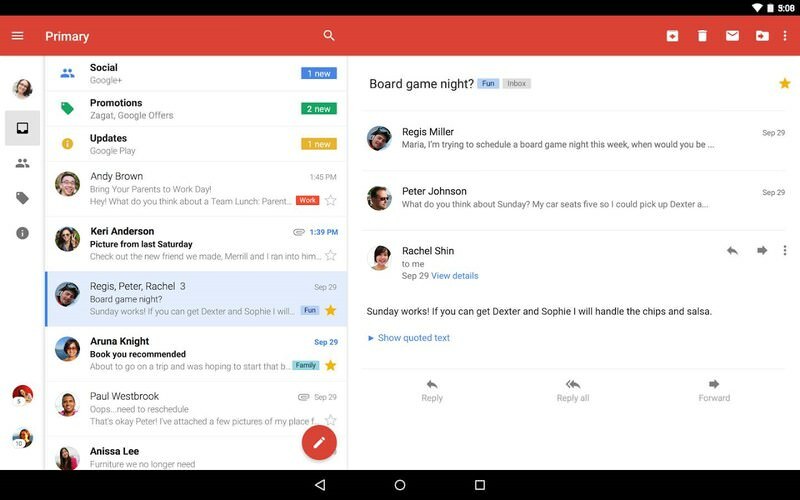 Alto is much more powerful, but Gmail is easier to use and is already installed in Android phone. Eventually, Gmail won as it’s easier to use and I didn’t have to install another app when something built-in can get the job done. 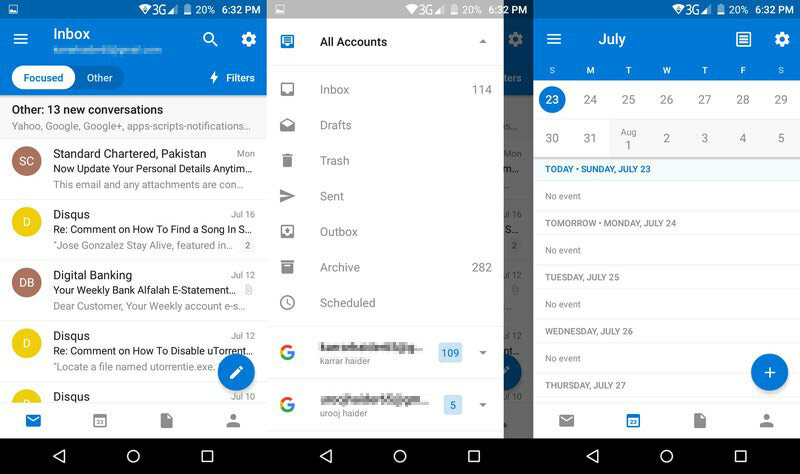 Microsoft Outlook for Android is actually a really good app for both organizing emails and managing multiple email accounts. Instead of different categorize, it has two modes, “Focused” and “Other”. The “Focused mode” list all important emails, and the “Other mode” list promotions and social emails. And I must say it does a great job of filtering priorities and less important emails. You can customize swipe function, see all the attachments in one place, view emails from all the accounts in one place, and much more. There is also a built-in calendar to keep you updated with your schedule. Overall, the interface is easy to navigate, but I did had a bit of trouble while switching between accounts. As it doesn’t automatically open inbox of the selected account when you switch, it seemed like my accounts were not switching. You will actually have to first select the email account and then tap on its Inbox to open it. Other than that, you can quickly switch between focused and other emails, and it shows sender’s photo next to each email for easy skimming. Separates important and less important messages. Easily view all the attachments. Supports Gmail, Outlook, Yahoo and Microsoft Exchange. Similar to Gmail, Microsoft Outlook has a minamalist interface. It perfectly organizes your emails, and keeps all the important functions just a tap away. Even though the two extra taps to access account emails did confuse me, but I won’t call it a big design flaw. Alto definitely wins the round when it comes to organizing your emails. Although if you want something simple, then Gmail or Microsoft Outlook are great options. If you don’t mind a rather dull interface, then Blue Main is actually a really good choice. It makes it easy to skim through emails, manage multiple accounts, and manage important tasks.